This project consisted of a system of two-level elevated roadways running along both sides and in front of the Ground Transportation Center and in front of the International Terminal, connecting to inbound and outbound ramps from I-380 and US-101. Summit Associates provided office engineering services during the closeout phase of this $175M roadway and structures project. 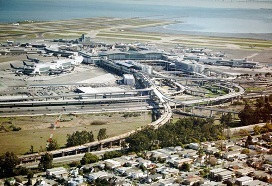 Summit Associates provided inspection, construction administration, scheduling, claims, change order and pricing review on this 2.4 Billion San Francisco International Airport project. © Copyright 2013 Summit CM, Inc.